Main Beach on the Gold Coast is not only for families and surfers who enjoy the ocean and the lively night time entertainment on offer. Couples or a single person looking for a place to relax and revive themselves will find that the area has lots to offer. If you visit Main Beach, Gold Coast during the off-peak season from May to September, crowds will be thinner and accommodation more affordable, but with its sub-tropical climate, the weather on the Gold Coast is almost always consistent and enjoyable. The first consideration when you plan a relaxing holiday is to find comfortable accommodation. At Norfolk Apartments, we offer luxury one-bedroom holiday apartments on Main Beach. 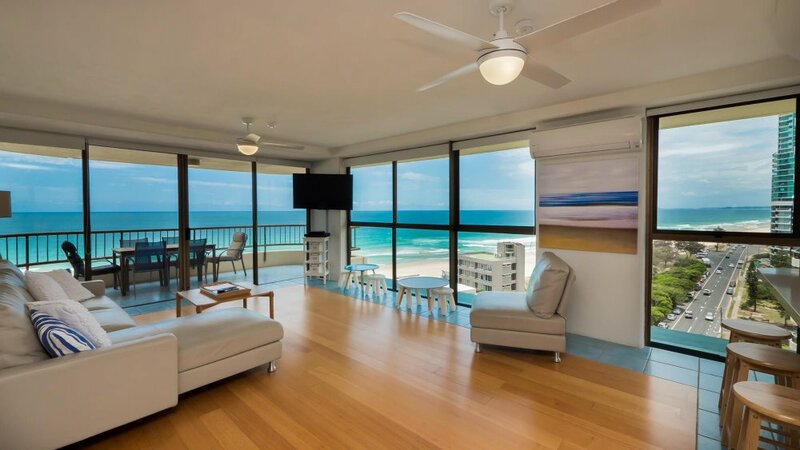 With spacious living areas, balconies facing the ocean and fully equipped kitchens (including dishwasher), our apartments provide all the comforts of home with spectacular views. If you plan to divide your time between going out to explore and staying in, you will love your accommodation at Norfolk. Our modern apartments come equipped with air conditioning, Foxtel, DVD player, large TV, and free Wi-Fi. On the grounds there is a heated pool, a spa, sauna, two barbecue’s areas and a full size tennis court. Norfolk Apartment’s one-bedroom holiday apartments are only 50 metres from the white sands of Main Beach. There is no better way to relax and unwind than a stroll on the beach and enjoy the sunrise or sunset. The Marina Mirage shopping Centre is only a short walk away from Norfolk Luxury Beachfront Apartments. The Shopping Centre, boasts more than 100 shops, and you can have your body pampered at one of its numerous spas and salons. For outdoor shopping, there’s no better place to go than Tedder Avenue. Walk under the leafy canopy of this stylish street, while browsing boutiques and speciality shops. Or stop at one of its many restaurants whenever your feet need a rest. On the weekends, heading to the markets is always a good idea. Saturday’s markets are at Marina Mirage. Whilst on Sunday there are the Farmers markets at HOTA – Home Of The Arts. HOTA is a brilliant cultural complex to have a stroll around, once you have finished eating your weight in beautiful organic produce! Currumbin Wildlife Sanctuary offers a tranquil outing with the opportunity to learn about animals in a natural rainforest setting – Currumbin Wildlife Sanctuary is a 40 minutes. Another attraction not to be missed is Sea World, with its breathtaking aquariums and habitats where you can view a large assortment of fish and marine animals. If you feel like spending time on the water, a Byron Bay day trip comes highly recommended. The tour includes a visit to Cape Byron’s lighthouse, tea at a working farm, and a few hours to explore Cape Byron’s bohemian capital on your own. Your Norfolk one-bedroom holiday rental on Main Beach is supplied with a fully equipped kitchen. There are several supermarkets within easy walking distance if you prefer to prepare your meals. However, if you feel like dining out, you will be spoilt for choice with the variety of restaurants along, the trendy Tedder Avenue and in the shopping precinct of Marina Mirage. Explore and discover hidden coffee shops favoured by the locals or dine al fresco at the many street-side cafés. You can enjoy everything from Australian to Italian, Asian or Seafood to name a few, only a short walk from your apartment. We provide secure off-street undercover parking for our guests who arrive by car. A bus and tram service are also available only a short walk away, and some attractions in the area offer packages that include pick-up from your accommodation. At Norfolk Apartments, we operate a tourism desk from reception and extend our guests access to more than 3 000 dining, tourism and leisure attractions along the Gold Coast. Book your holiday accommodation at Norfolk Apartments today.